I was driving my kids home from tennis practice at McFetridge Sports Center on a stretch of 2400 block of West Irving Park Road I've traveled a 1000 times. My 8 year old son pointed out a billboard ad that spelled "KUBS" instead of "CUBS". It's sort of an unfortunate advertisement for a tattoo removal service. I looked at the billboard ad and then looked under it. The giant billboard (and it's big relative to the surrounding location) appears to be planted on the property. It does not appear to be on the city parkway. Public records show the last sale of the house was in 2004 for $295,000. 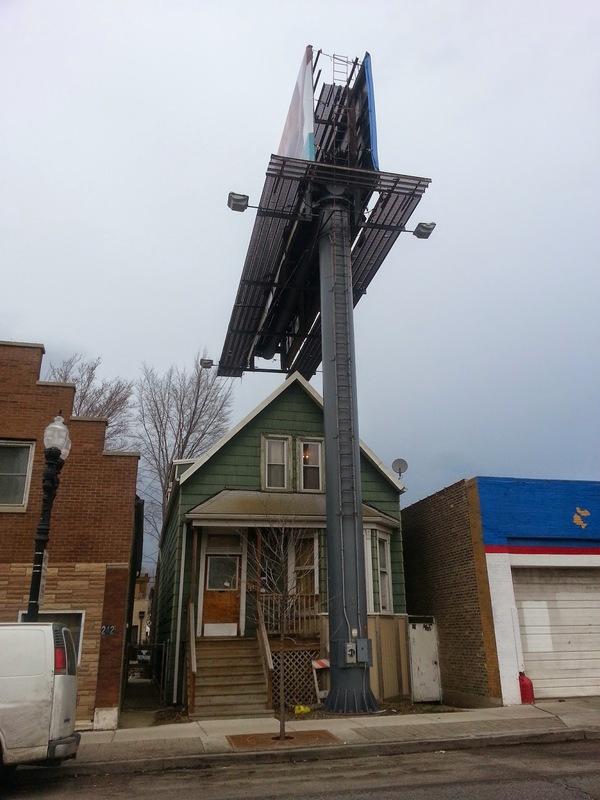 I don't know if the billboard was there at that time (my guess is probably). I showed the photo to my wife and the first question was "How much could we get to do that?". 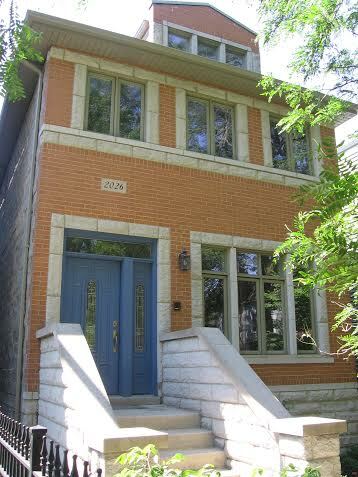 4727 N Damen Chicago IL 60625 in Lincoln Square/ Ravenswood (Photo Bob DePalma and Eric Rojas, Brokers Kale Realty). 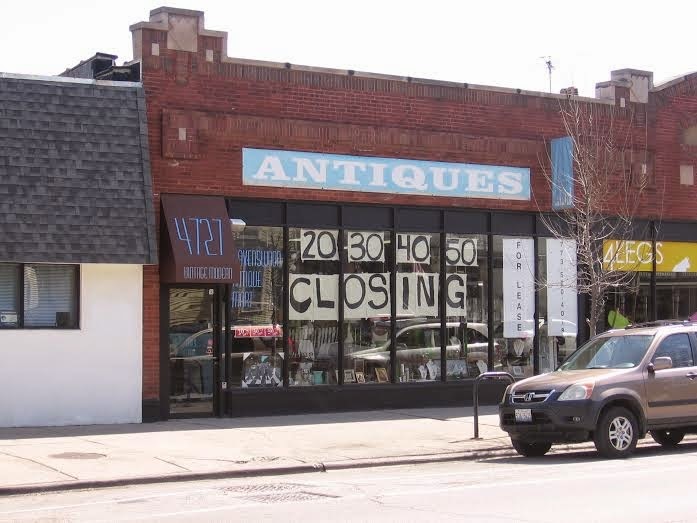 We spotted the large CLOSING and for lease signs at Ravenswood Antique Mart 4727 N Damen, Chicago IL 60625. The long time dealer with the attractive store front and pricey items (my opinion) has been a mainstay on the Damen Avenue commercial district south of West Lawrence. No mention on the store's web site about the closing. 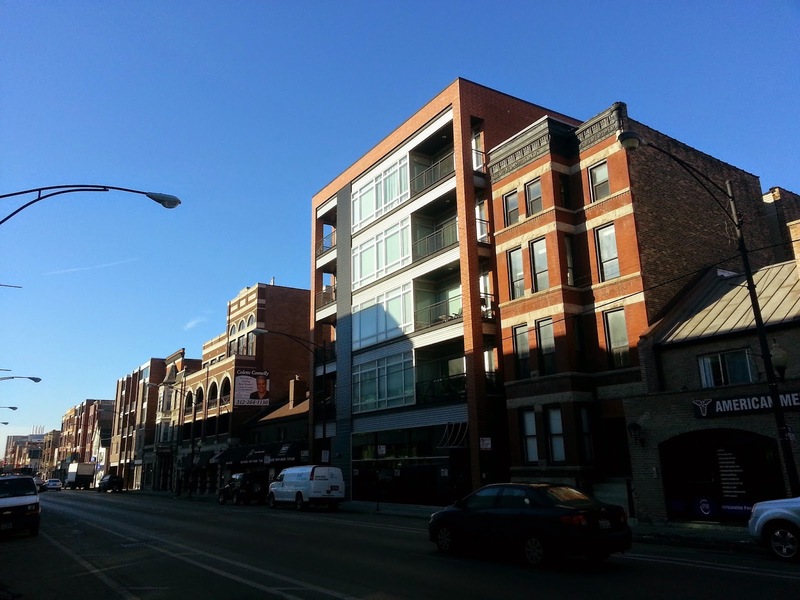 The area of Damen and Lawrence has seen significant infrastructure improvements, large retail, apartment and condo developments along with new independent businesses both north and south of (and along) West Lawrence Avenue. It's booming. Will be interesting to see what moves in. 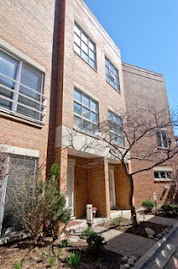 We represented the buyer purchase on 1113 N Ashland #3N, Chicago IL 60622 closed for $685,000. 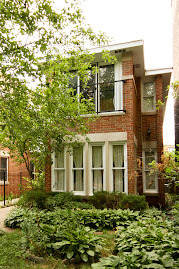 We recently sold our client's condo in Mayberry like Lincoln Square. She traded up for the new construction three bedrooms, two and one-half baths condo with two attached and heated garage spots. The condo features a ridiculous outdoor space for ultimate indoor/ outdoor living. The location is steps from some of the best bars, eating and music venues in the city. Dusty Groove and tons of independent shops, bars, cafes and music venues surround the condo. Photo Eric Rojas, Broker, Kale Realty. 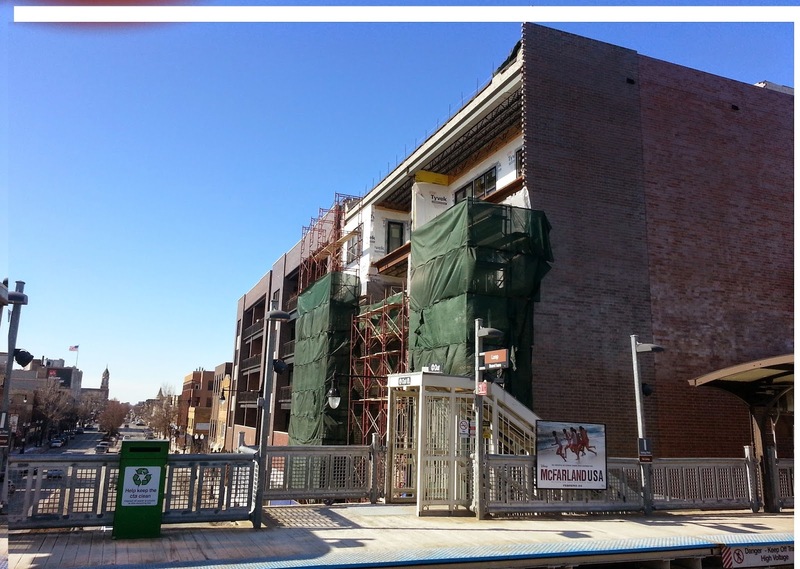 New construction, two garage spots and proximity to the CTA Division Blue Line were important must haves that sealed the deal. 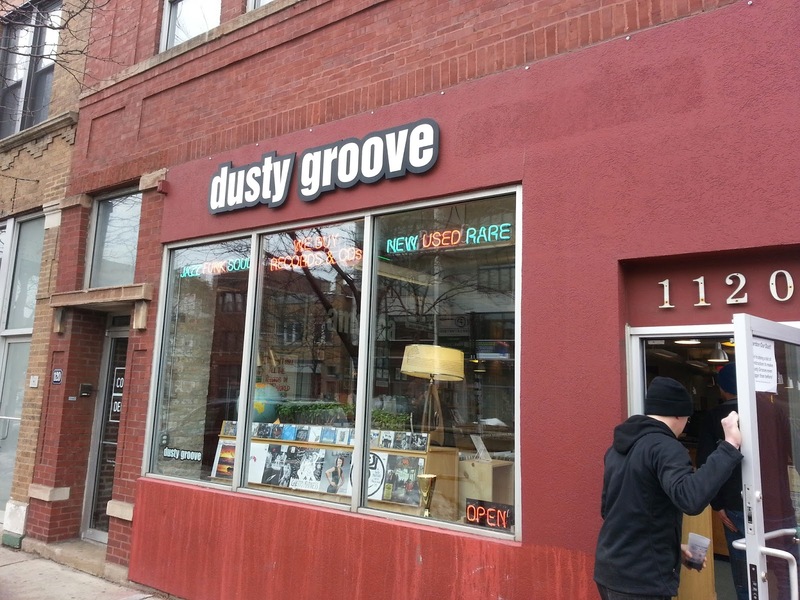 Even more important the condo is located across from long time vintage music selling institution Dusty Groove at 1120 N Ashland, Chicago IL 60622. Oh yeah. 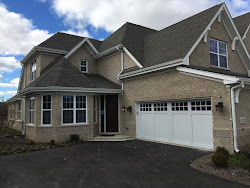 We wish out client the best in her new modern home with much shorter commute to work. Groovey. 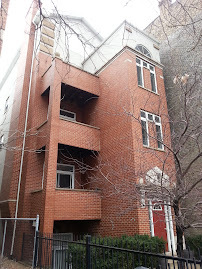 Recently featured on HGTV House Hunters an updated 450 sq/ft junior one bedroom unit at 450 W Briar sells for $135K. 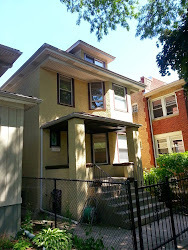 In the last 12 months another three full one beds (larger units) sold for between $205-215K. Right now, there are two junior one beds under contract (one a short sale), three full one beds under contract and one active unit available with deeded parking. The building features an underground garage (deeded parking spots sold separately and not necessarily offered with a unit), roof deck and fitness area. 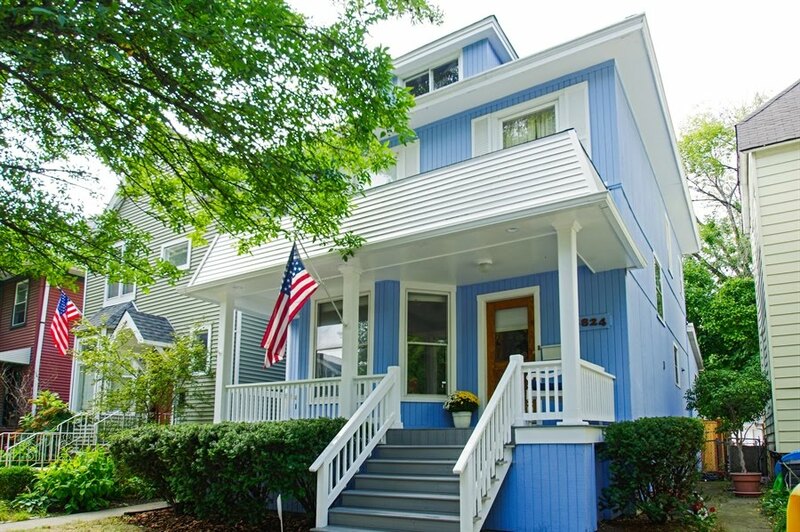 We've sold several properties on the 400 block of West Briar in East Lakeview. We love the location and the properties on the street! 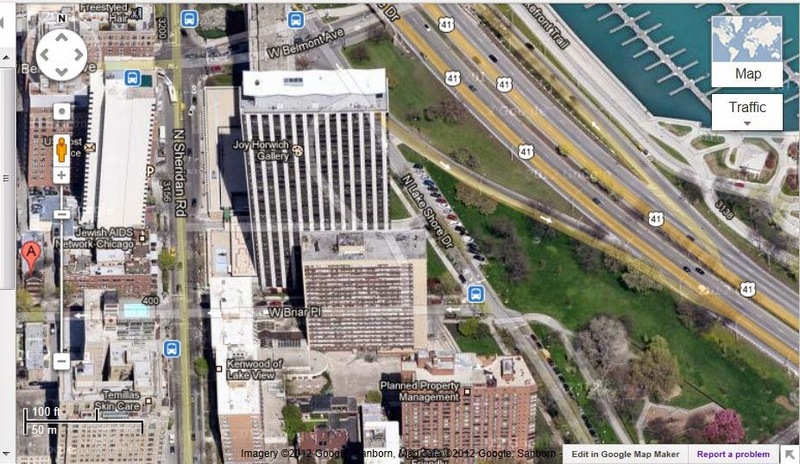 Controversial Crain's article on Lincoln Park population debunked? 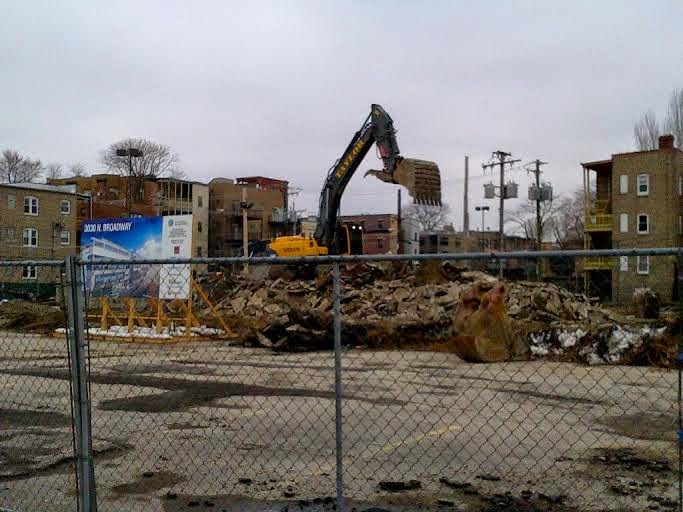 Crain's published a much debated article on "population loss" in Lincoln Park this week. Many Crain's reader comments lament the population woes throwing the Alderman, pensions, zoning procedures, NIMBY's. 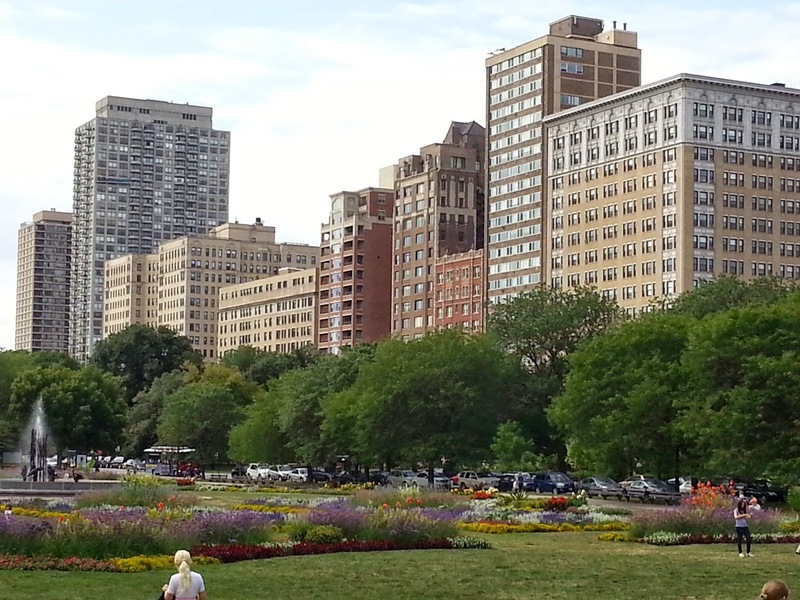 In short, most people's gut reaction was gloom and doom for the "dead zone" that is Lincoln Park. 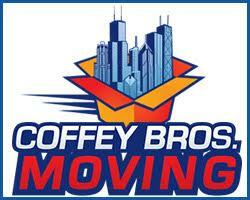 There is clearly room for better process in zoning and development in Chicago overall. However, the "pile on" to the article is surprising. Why do so many reader comments on the Crain's story feel the city is doomed based on Lincoln Park (and other affluent north side neighborhoods of the city) population? Read a measured counter point from www.YoChicago.com. Lincoln Park 2550, the 218 unit luxury building at 2550 N Lakeview, Chicago IL 60614 was completed (on the site of a former parking garage) well after the 2010 census. The Crain's author makes a lot of assumptions, and in my opinion, is unrealistic in terms of accessibility of real estate in general. It is unrealistic for anyone to be able to afford any community they desire at any given time. This goes for tony suburbs and vacation spots as well. The author also assumes Lincoln Park to be more desirable to most people than other parts of the city (or suburbs I guess). It also assumes that a large population that wants to live there is priced out. "The fact that Chicago's affluent North Side communities have lost so many people and aren't gaining them back is a huge problem for many local businesses, current residents of moderate means and anyone who would like to move there but can't afford to. But even if none of that describes you, it's also a problem for those of us who'd like to see City Hall have more resources to invest in other parts of the city, from policing, to schools, to transit, to road repair. It's a problem for those of us who'd like to see more jobs created within commuting distance of Chicago communities where unemployment is endemic. It's a problem, in other words, for all of us." Webster Square rental apartments has added 75 units alone after the 2010 census. 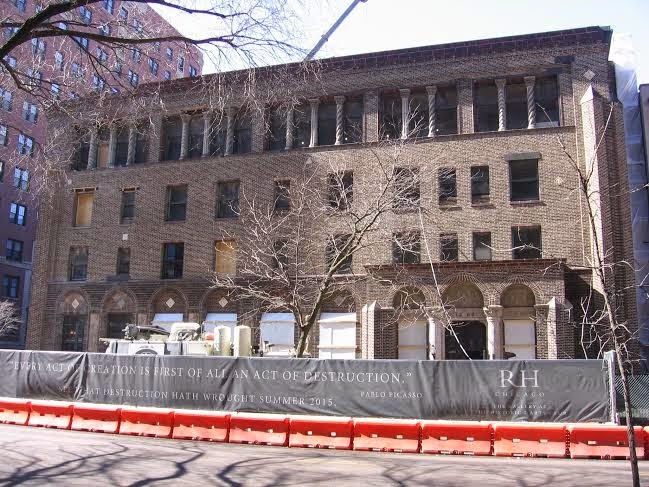 100 more units are coming with the construction of an adjacent condo building. 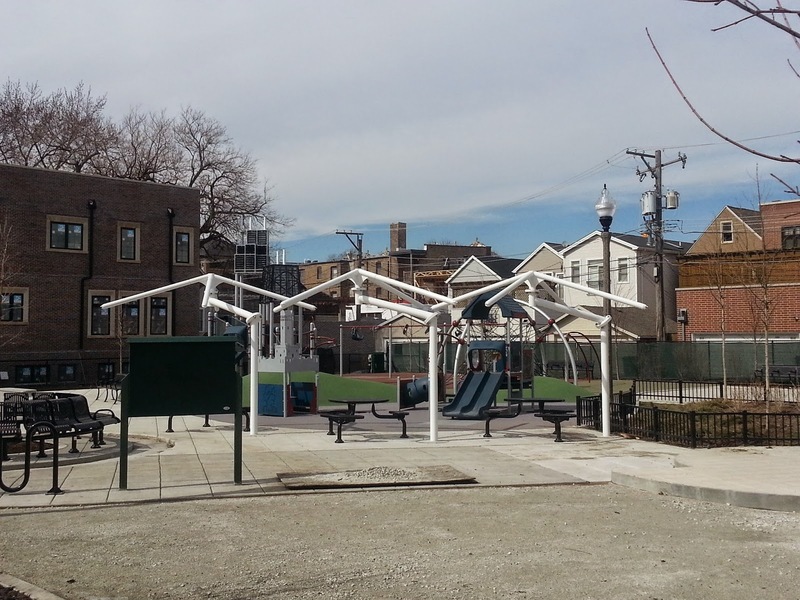 Anyone who’s familiar with the history of Lincoln Park knows that large parts of the neighborhood had fallen into slum conditions by the 1950s and 1960s. 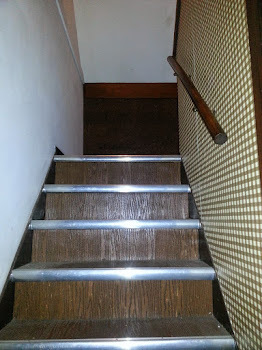 Many of its properties were overcrowded, in part due to illegal conversions, in part due to an almost complete lack of new construction from the beginning of the depression-era to the years immediately after World War II. 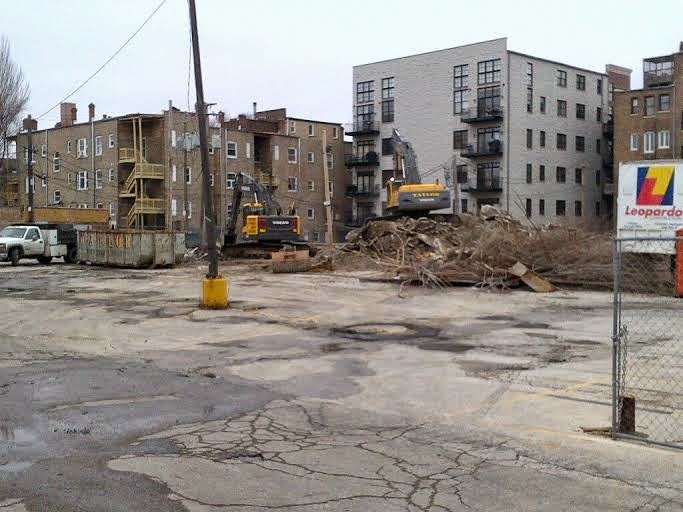 The City used urban renewal funds to clear some of the worst areas, including what is now Oz Park and the large townhome developments north of North Ave.
Is there a problem in Chicago where you have impoverished neighborhoods with less economic development and resources? Yes and it's as serious and alarming as at any time. However, I don't think the population trend of Lincoln Park (and other "affluent" neighborhoods) is the deterrent to development throughout the city. No relief for Ravenswood Metra Union Pacific North riders exposed to the elements with the recent spring cold snap. 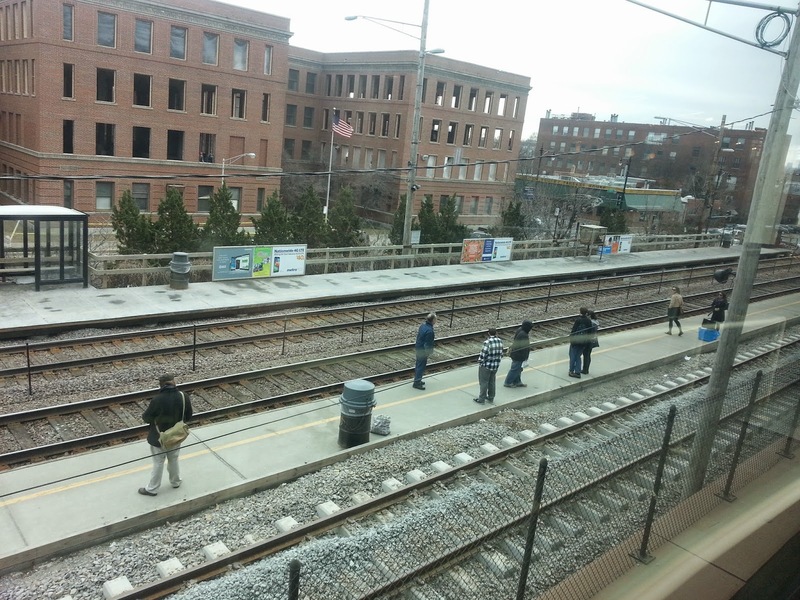 CBS Local reports the newly built shelter is not open yet due to a delay installing the new tracks. The new projected opening is for May. Bring your umbrella for April showers. 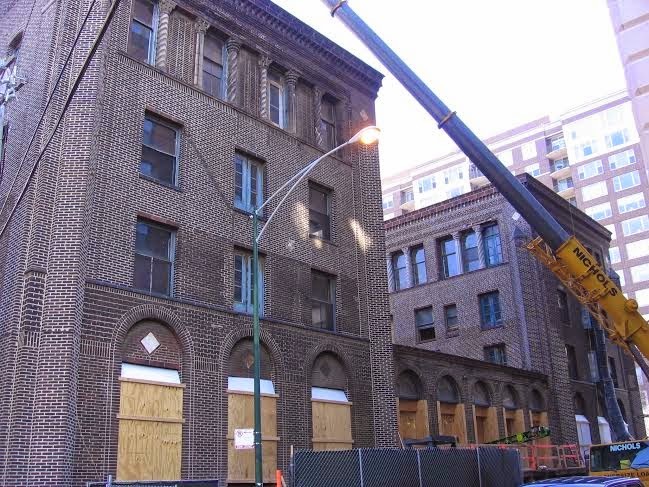 The long awaited development at 3030 N Broadway, Chicago IL 60657 moves forward. Bob snapped a couple photos today after a business visit to the Lakeview neighborhood. The densely populated neighborhood isn't exactly a food and gym desert but the new Mariano's Fresh Market and XSport Fitness should prove popular among the city dwellers nonetheless. The Mariano's is projected to be open in June of 2016. 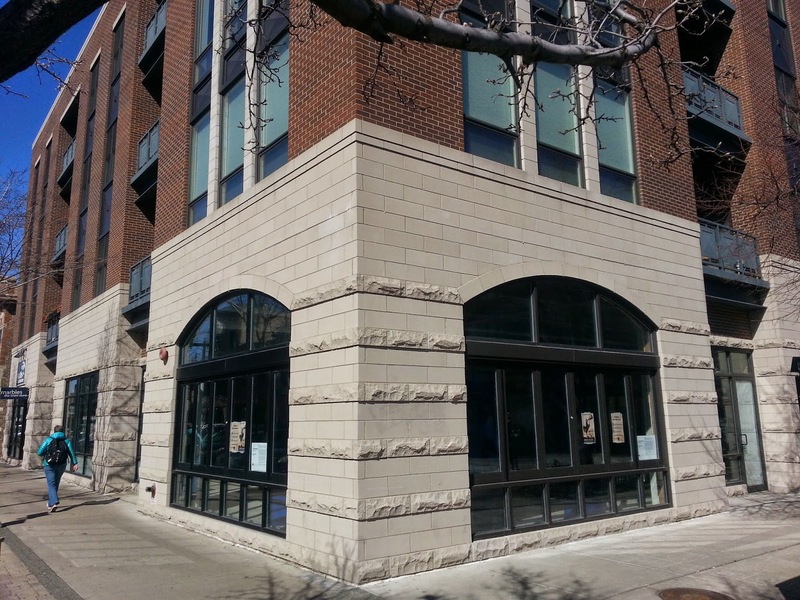 A new Jerry's Sandwiches location was hoping to open in the high profile Fountain View building location on Giddings Plaza, Lincoln Square by spring / June. (All photos Eric Rojas, Broker, Kale Realty). 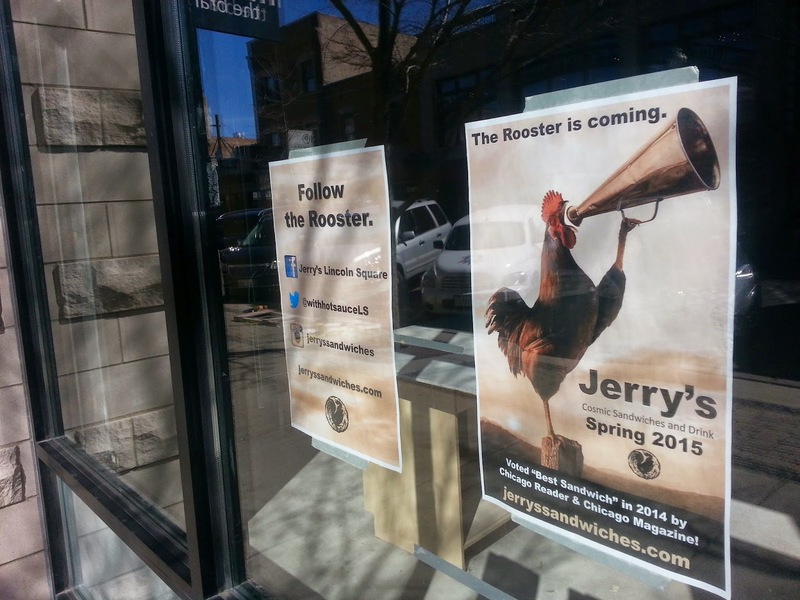 All is quiet at the proposed Jerry's Sandwiches location at 4739 N Lincoln Avenue, Chicago IL 60625. A handful of high profile Lincoln Square restaurants have taken their sweet time to materialize - or fizz out - after initial announcements. Roots Pizza anyone? It's understandable that "issues" delay openings... but people get really pumped up around here when well known entities contemplate moving into the neighborhood. They want gratification! It looks like Jerry's Sandwiches will take a little more time too. The attractive storefront overlooking the plaza... the final piece yet to be realized to an amazing European city center atmosphere. The space is still a vacant "box". Should be a Jerry's! It could have been a Flatbred! Whew. On a related note the price tag to live above quality sandwiches and gelato at the 2326 W Giddings condo building ain't cheap. Median price of the last three two bedrooms, two bathrooms is about $414,000. I have a couple emails in to sources close to Jerry's and hope to get an update. Feel free to email me direct as well (comments moderated). 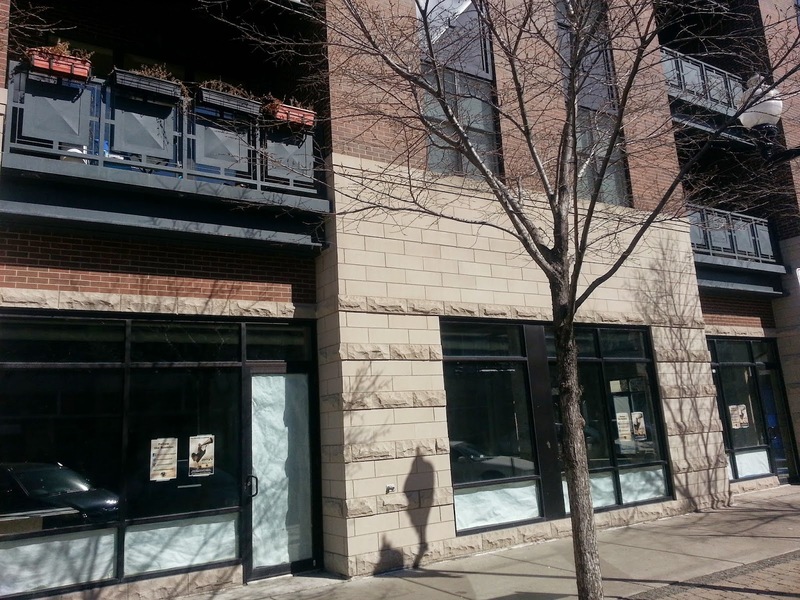 UPDATE 3/26/15: 47th Ward office states the restaurant is still in "permitting process and working through some things with the city. No known timeline for an opening yet. 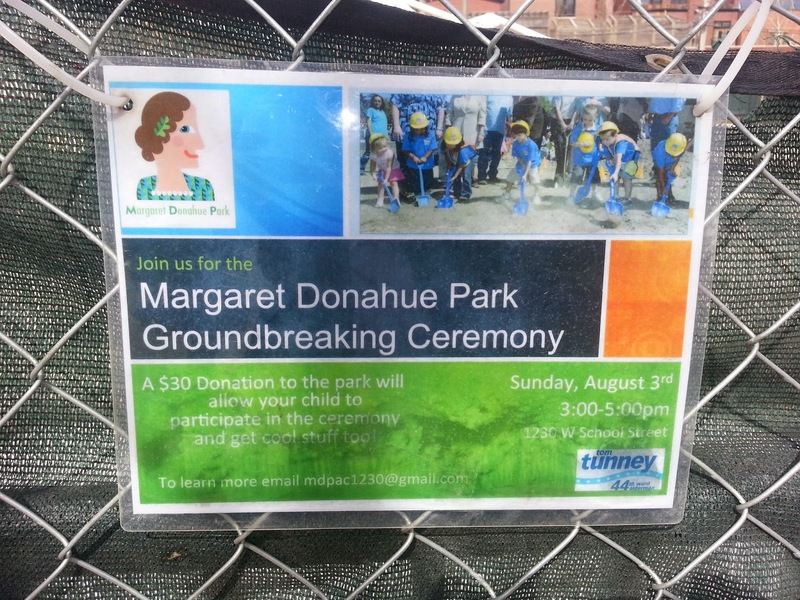 I snapped a few photos of Lakeview's new Margaret Donahue Park at 1230 W School Street, Chicago IL 60657. Check out the background story by DNAinfo. Looking northeast (all photos Eric Rojas, Broker, Kale Realty except where noted). The neighbors must be ecstatic. Residential single family homes, condos and townhouses flank the large park site that once was home to an industrial building. Personally, I've felt Lakeview, for all it's benefits and lakefront parks, has lacked green space and open play space in it's interior where more single family homes are situated. This is a major victory and will be a very popular meeting place for the community. 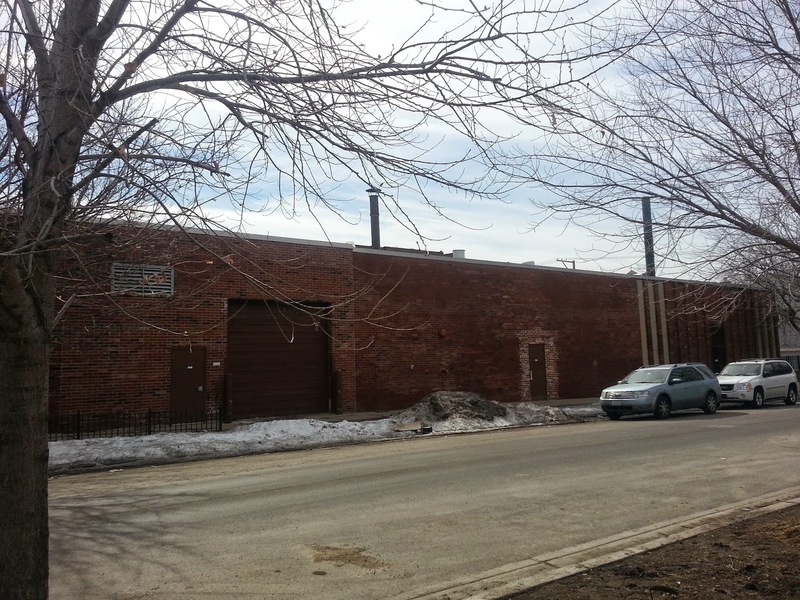 The former Swartz Products building originally sat vacant for many years (Photo from MREDLLC.com/ Greenview Realty, Inc). There was a listing on the MLS as late as 2010 offering the 4.5 city lot property for $2,600,000. According to public records Openlands acquired two addresses at 1234-1236 W School for a total of $1,150,000 in 2011. The Chicago Park District acquired the property in 2013. I don't know of any other land purchases but $1,150,000 would be easily less than half of market value today. 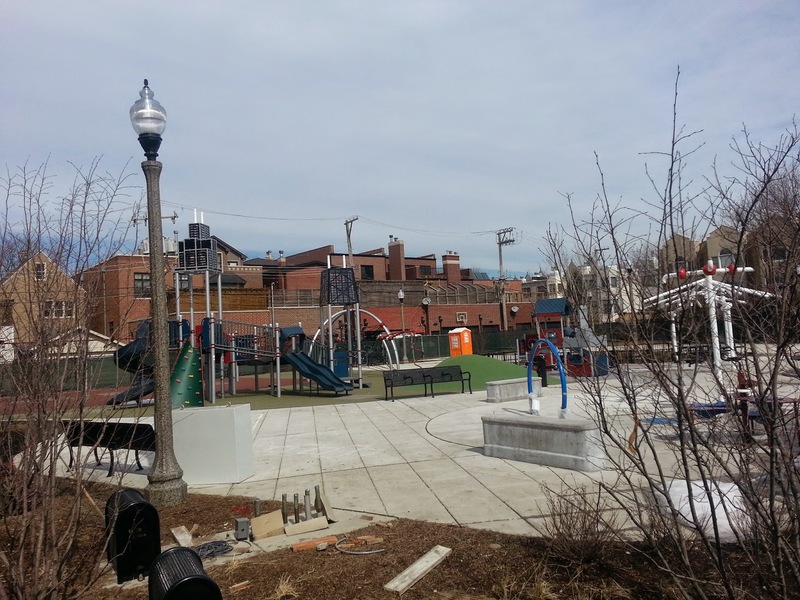 Image of the completed park. A new construction single family home at 1238 W School, Chicago IL 60657 adjacent to the park is under contract at $2,500,000 according to MREDLLC.com. The original property sold in 2014 for $650,000. 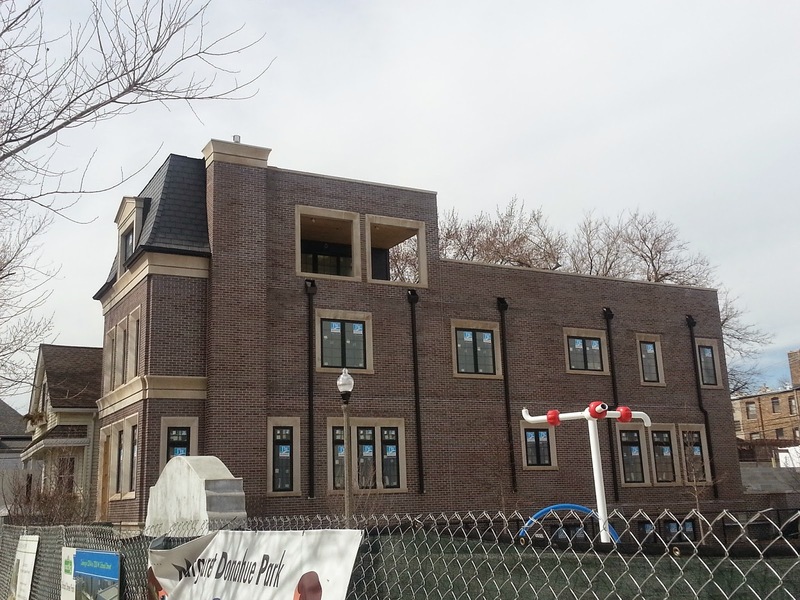 A town house development built in the early 1990s at 1220 W School sits on the east fence of the park. One town home in the development is currently under contract asking $534,900. 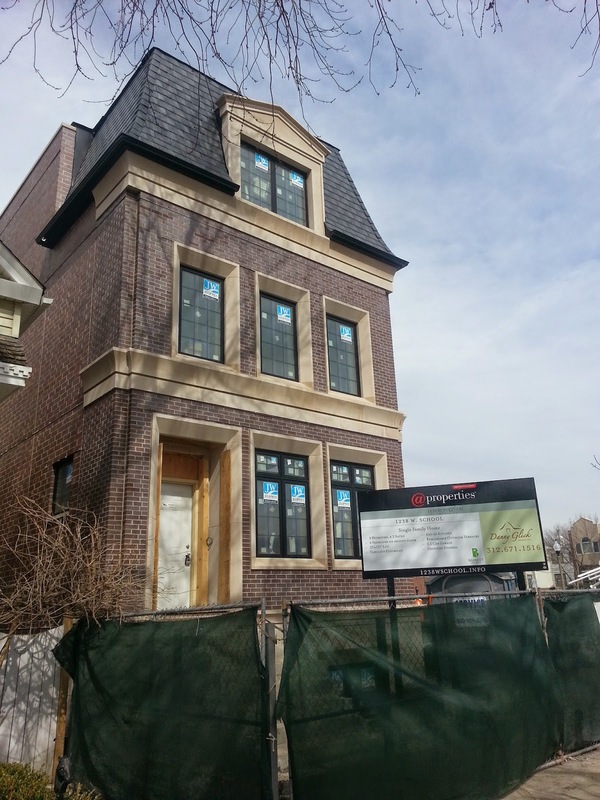 No end to luxury new construction single family homes around Lakeview. An industrial building sits across from the park. 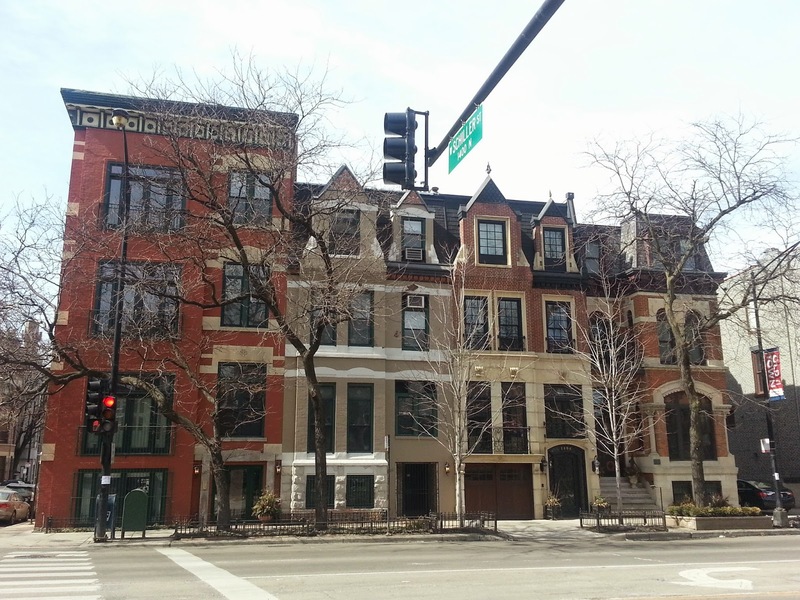 We had a client appointment at Sandburg Village last week along the 1400 block of North LaSalle. The west side of the block is home to a group of new and vintage buildings along an unassuming stretch of far west Gold Coast. 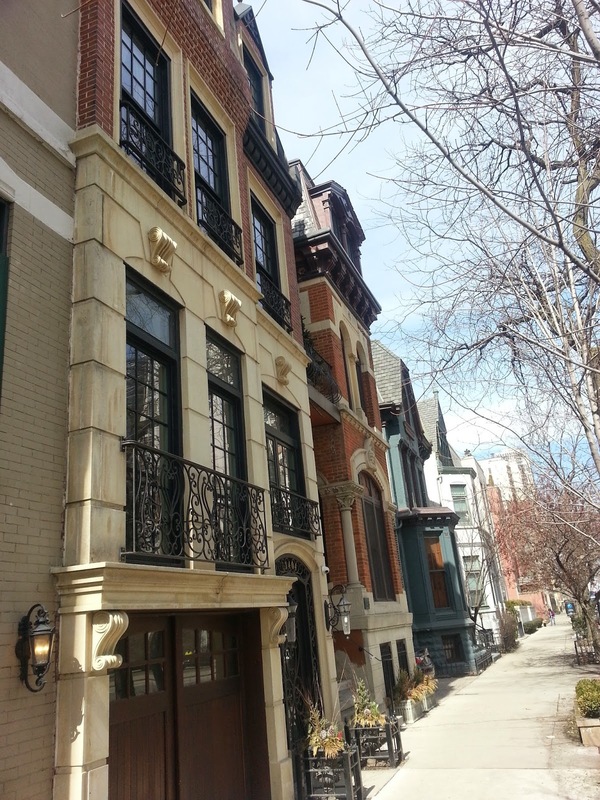 The attractive looking homes can be easily missed when zipping down LaSalle. Prices for two bedrooms, two baths condos easily exceed $500,000 on the block. 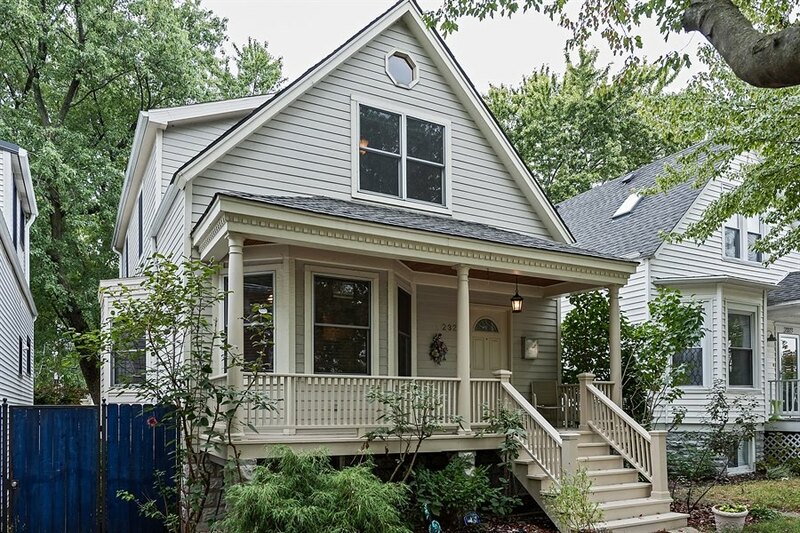 The striking newer build or gut renovated single family residence at 1404 N LaSalle features carriage style attached garage doors. 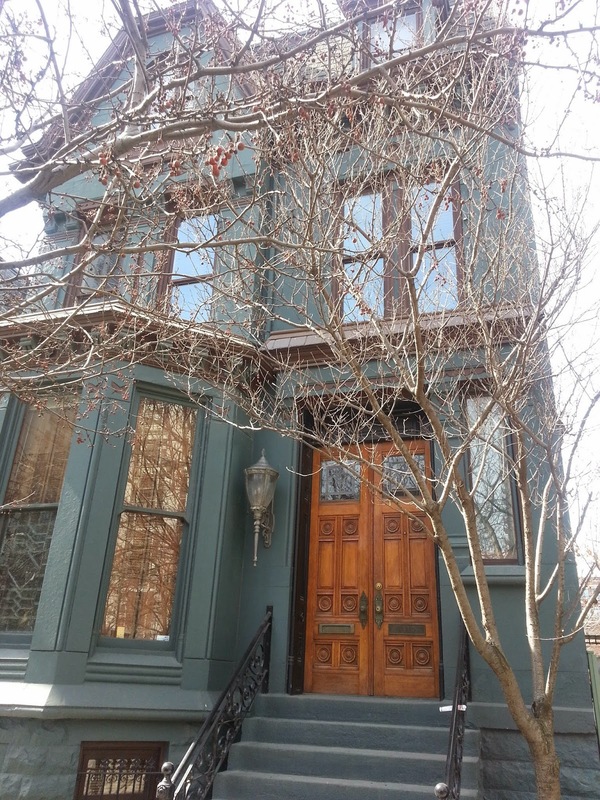 The property was last sold as a "red brick Victorian" multi-unit in 1997 for $350,000. 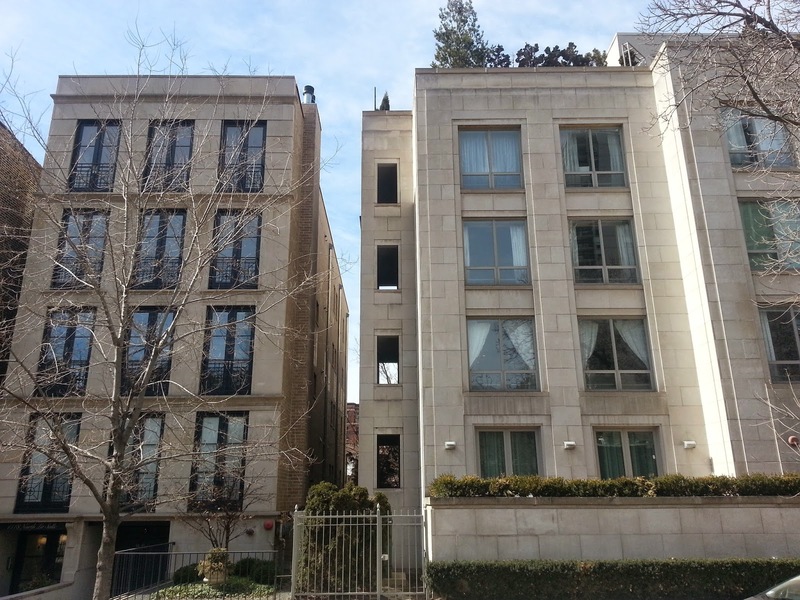 1418 N LaSalle to the left was built in 2008 replacing an artists single family home and coach house. The new condo residences sold for over $1 million at the time and I have not seen a resale yet. 1422 N LaSalle on the right is a larger building built in 2004 with sales ranging from the $400s to $1.2 million. Several vintage homes exist among the new builds. 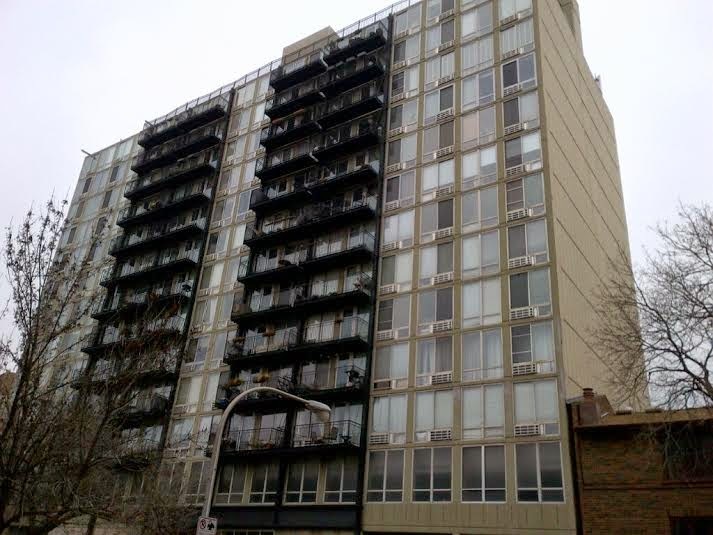 1430 N LaSalle shown below has had several re-sales in the past two years. The 14 unit courtyard style building offers duplex and triplex condo units with warm finish level. Closed prices have ranged from $620,000 to $700,000. Can't say I'm crazy about the look of this 1995 built courtyard building at 1430 N LaSalle, Chicago IL 60610 but it offers unique, spacious units in Gold Coast/ Old Town. 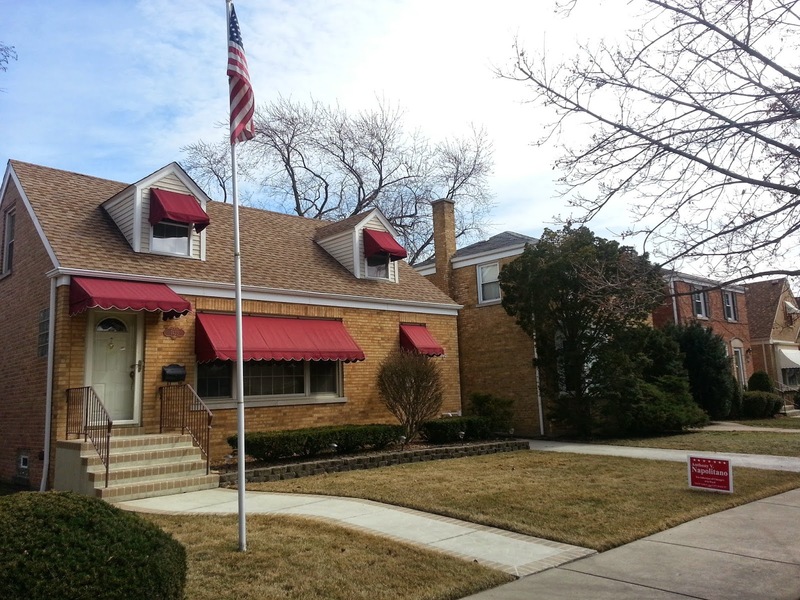 We recently helped clients secure a single family home in the Edison Park neighborhood. Sales took a decent jump over the first quarter over the past few years. 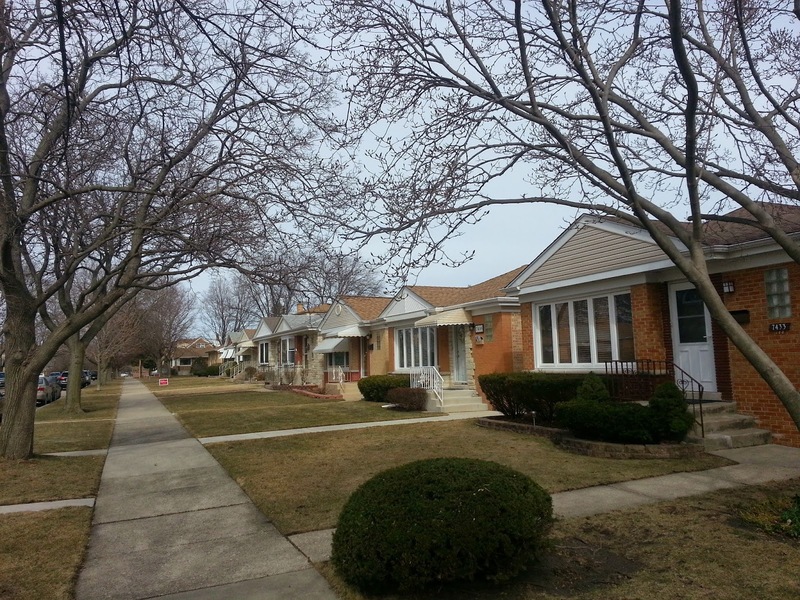 Here's a look at over-all home sales in the far northwest Chicago community area. 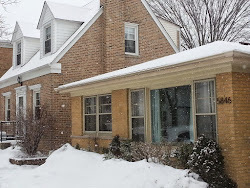 21 single family home have closed thus far in Edison Park. The median price is about $315,000. Unit sales are up about 40%. The median price generally gets you a small raised ranch or a frame house in need of many updates. Over the same period last year 15 homes closed for a median price of about $280,000. 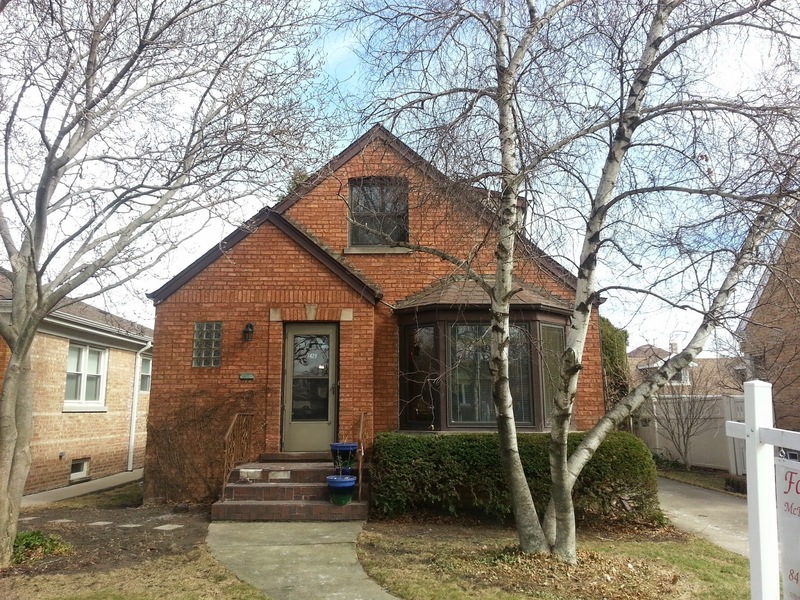 The lowest priced home to sell is 7755 W Columbia, Chicago IL 60631 for $220,000. The foreclosed raised ranch may have had a "squatter" situation creating risk and downward pressure on the price of the home. It still sold fast. 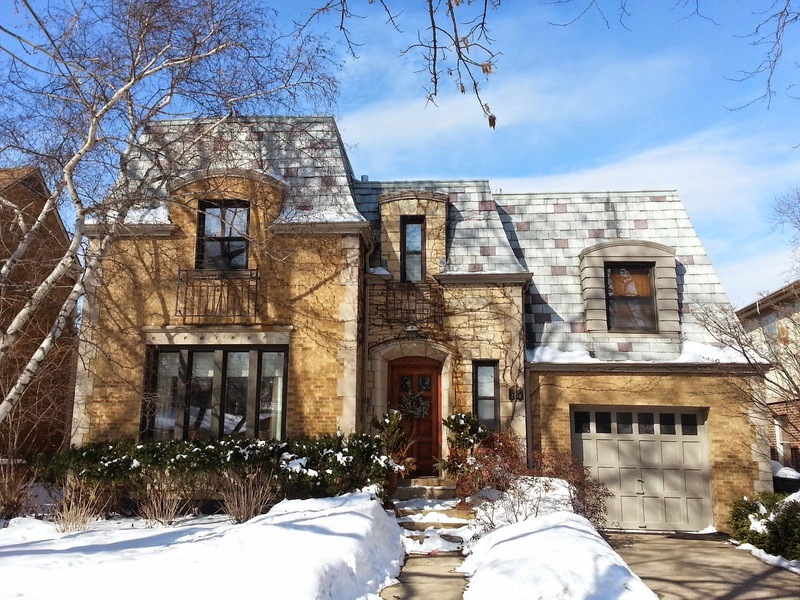 The highest sold homes by far this quarter is 6850 N Olcott, Chicago IL 60631 for $895,000. This was also the highest priced home sold in the first quarter (year to year) over the past 5 years. The custom built new construction home sits on a 50' double lot. 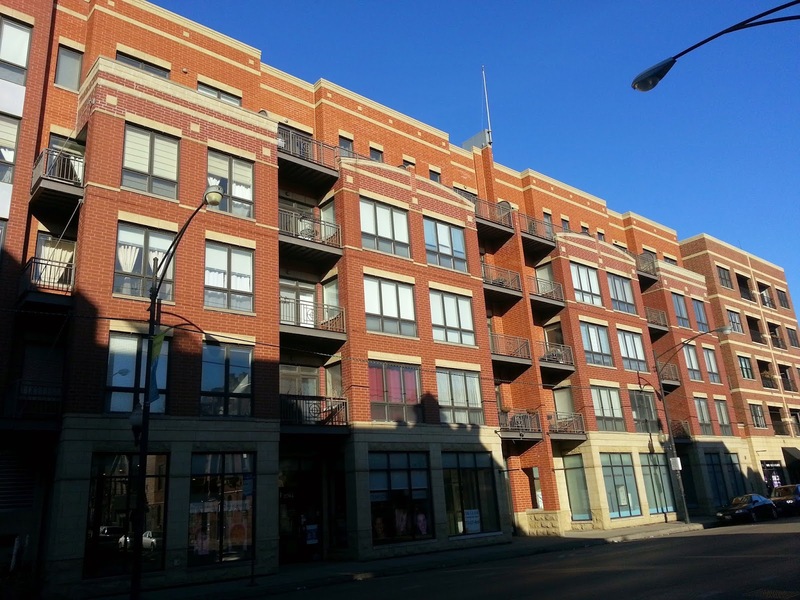 Edison Park unit sales and median price are trending up over the last 5 years. 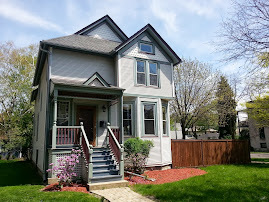 Realtor at work: Dormer this old house! We met with clients and contractors early this morning to start planning a home renovation in Edison Park. The old staircase won't do! The buyers want to dormer the house. As brokers we can gain access to the home during the transaction prior to closing. We also help source contractors and materials when needed. 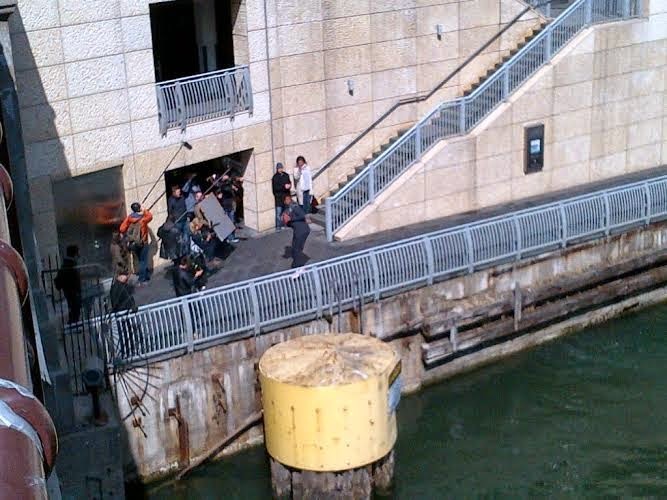 Bob was walking over the Wabash bridge by Trump Tower today and snapped this shot of former Florida State quarterback Jameis Winston throwing a football across the Chicago River. The controversial Heisman Trophy winner and projected first rounder in the upcoming NFL draft was filming a commercial or promo spot. "Great toss Mr. Winston. Now, do it again with more feeling". 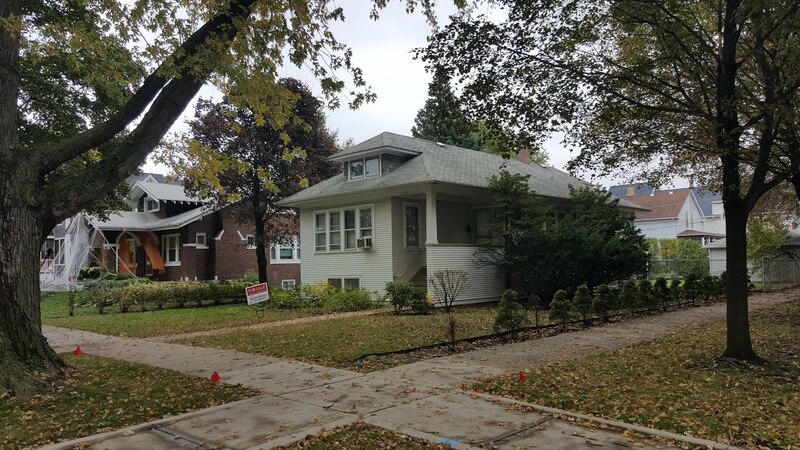 We recently helped buyer clients secure an attractive brick Edison Park single family home at 7429 N Ottawa. The estate sale listing went on at a low price attracting multiple offers. The neighborhood is known as a haven for city workers and sales have been hopping. With contract in hand we viewed the home with clients and quickly submitted an offer for the house within an hour. 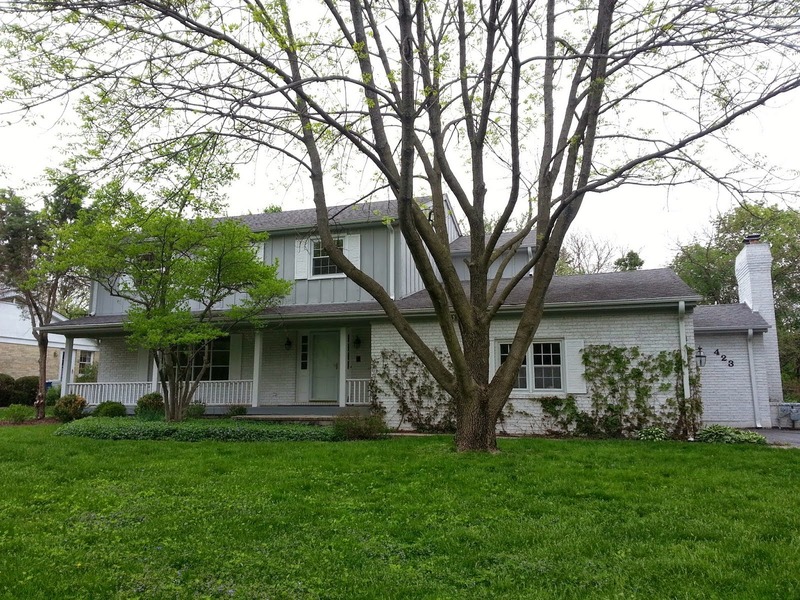 The bid process lasted a few days and was handled very professionally by the listing broker. We pulled no punches and submitted a personal letter on behalf of the buyers. The buyers came with a strong final offer to get their preferred location. The 7400 block of North Ottawa is lined with manicured lawns and well kept bungalows and Georgians. 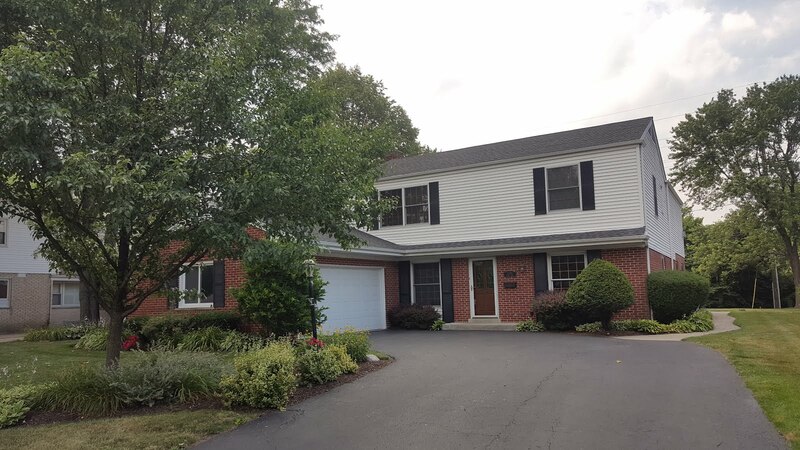 The home is located in well rated Ebinger Elementary School ... the number one priority for these particular buyers. Edison Park also features a lively and local flavored business district. We'll continue to work towards a smooth closing for our buyers! 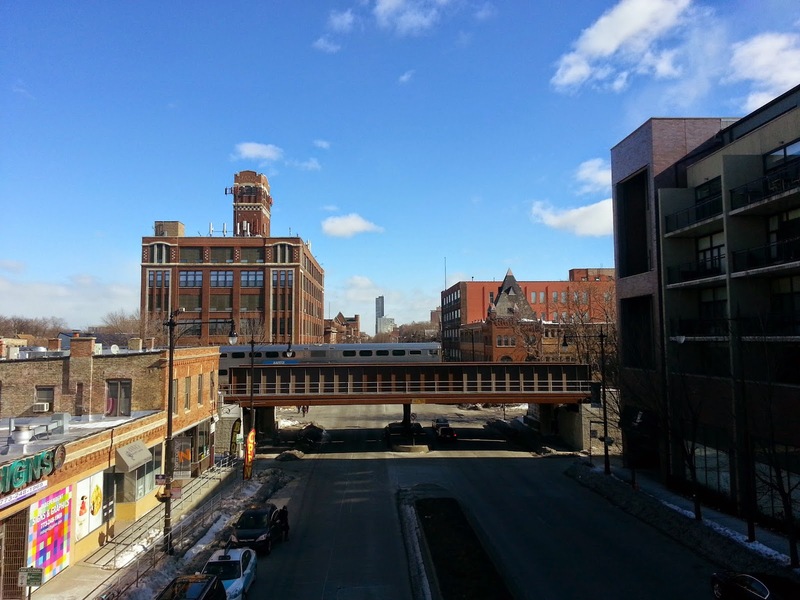 The neighborhood around West Irving Park Road and North Ravenswood maintains a cool city grit due to the remaining industrial buildings mixed in with residential buildings and store fronts. 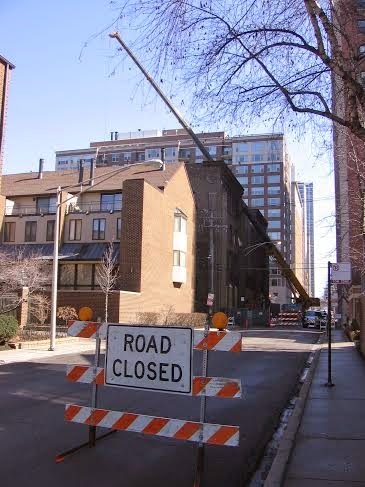 33 condo units (attached homes including town house) have closed over the last 12 months along Irving Park Road. The sales are fairly mixed among vintage converted buildings and newer construction. The median price of a condo along this stretch is a hefty $424,000. The high unit prices sold reflect new construction and the relatively larger vintage options available along Irving Park Road at the price. 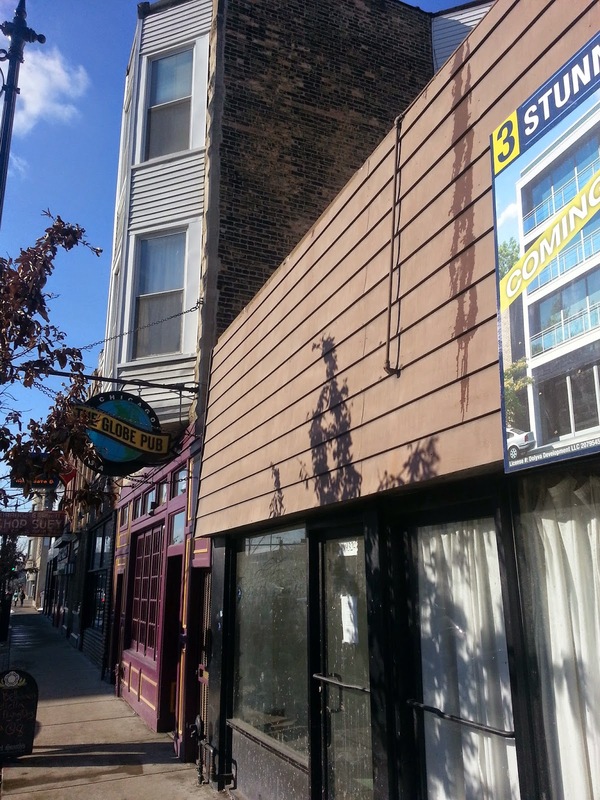 The property adjacent to popular soccer bar (The Globe Pub, 1934 West Irving Park Road, Chicago IL 60613) is slated to be three new construction residential units. Buyers and builders look for cheaper alternatives in good locations when the real estate market gets hot. The busy four lane stretch of West Irving Park Road (from North Clark Street on the east to North Western Avenue on the west) has seen spurts of new residential development in the past 15 years. Builders and buyers can buy at a bit of a discount for the noisy street but benefit from the many transit and business options. A large new construction residential building goes up adjacent to the CTA Irving Park Brown Line stop on Irving Park Road. A new three flat building is slated for construction a half block west. 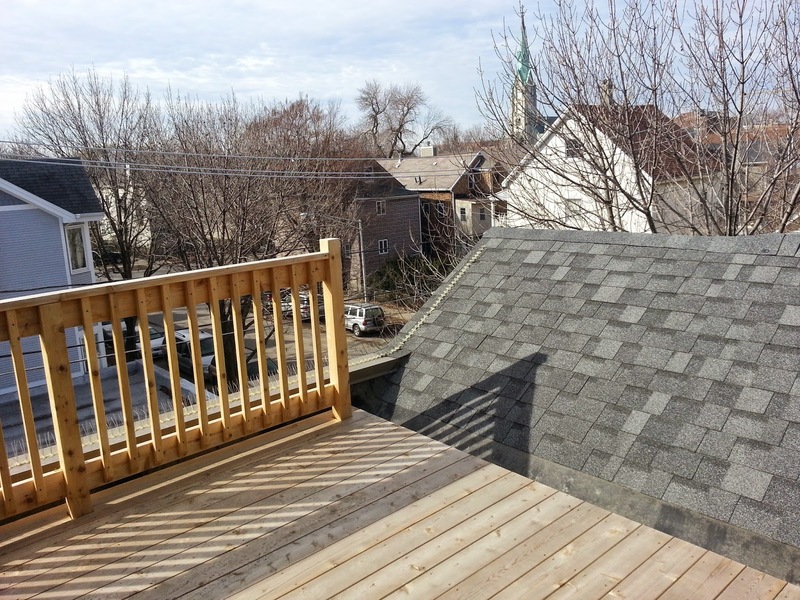 Our clients installed a new flat roof and City permitted cedar roof deck prior to listing their home. However, the buyer's lender required another railing installed as a condition of the buyer's loan. The sellers thought it very reasonable relative to the over-all sale. 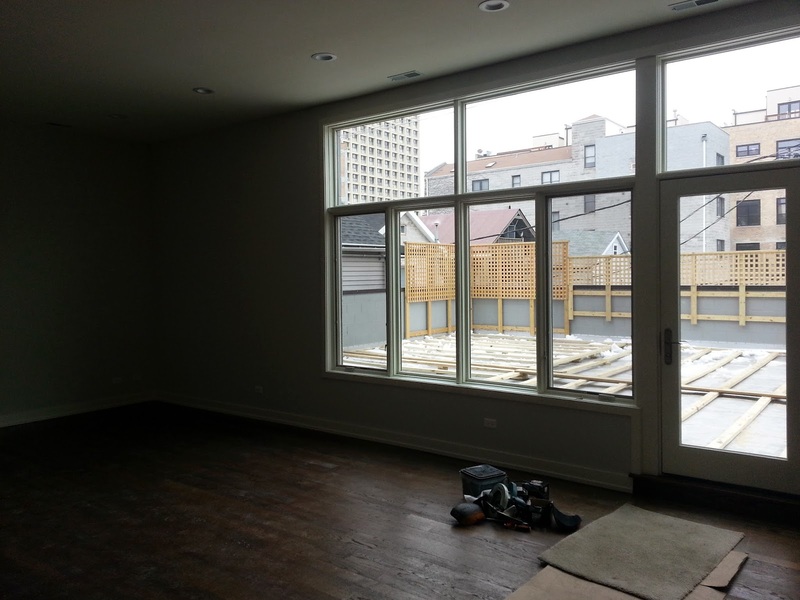 We met with contractors in the Lakeview neighborhood this morning at one of our recent listings. 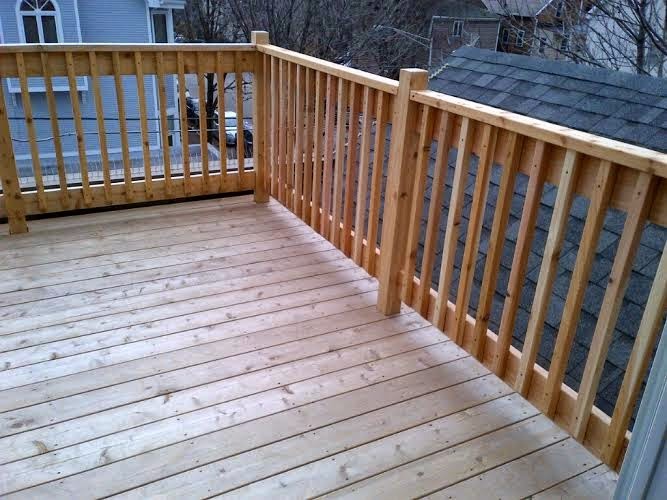 A hand-railing must be installed on the roof deck as a condition of the sale. We often advise our clients on renovations and repairs prior to and during a transaction. We also meet with contractors and manage the process in replace of the home owner (saving them time and money). In this case the rail issue was brought up by the buyer's lender (during the property appraisal). We quickly brought in a long time contractor relationship who matched up the rail and installed within a week of the lender request. The new railing was installed in a few hours this morning! We help our clients make sound decisions when considering selling or buying a home. Our combined experience and on-site management can help save time and money before, during and after a home sale or purchase. 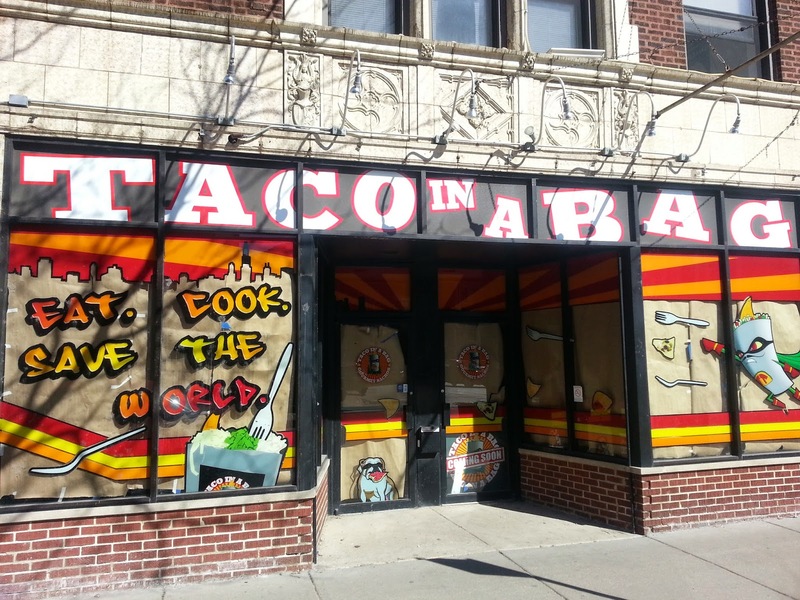 DNAinfo wrote a nice piece on the new Lincoln Square Taco in a Bag location 4603 N Lincoln Ave, Chicago IL 60625. I like the diversity of establishments coming in and around Lincoln Avenue. Shake it up! Bob took a few photos of the construction progress last week while on appointments in the Gold Coast. The historic and landmark status Three Arts Club building, originally home to female artists, turns to retail, gallery and restaurant space led by Restoration Hardware. A September 2014 story stated there was still controversy over the retailers plans to alter the interior of the building. A December follow up discusses some of the ongoing work. I once helped cater an event at the Three Arts Club in the late 1990s while still working as a bartender. Owners of Four Moon Tavern (my regular corner bar with deep theater roots) asked me to help out at the event featuring a Second City performance. Needless to say, some of were interested in the female artist occupants too. 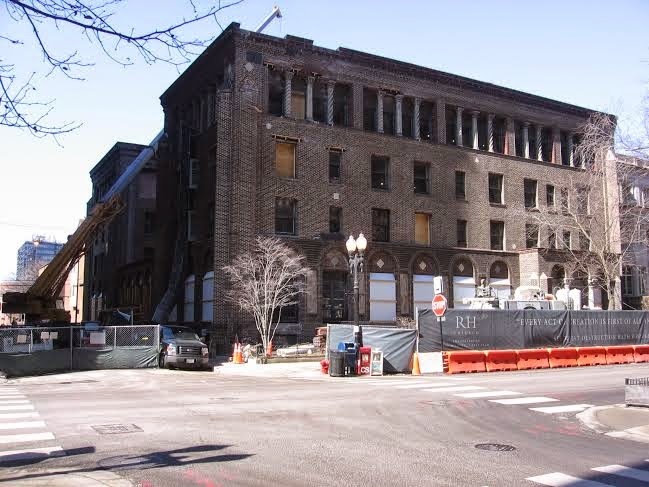 For more history of the property, the Three Arts Club and its woes the Chicago Reader offers this story from 2006. The building has stood vacant since 2003. Work continues on the Three Arts Club building in the background. 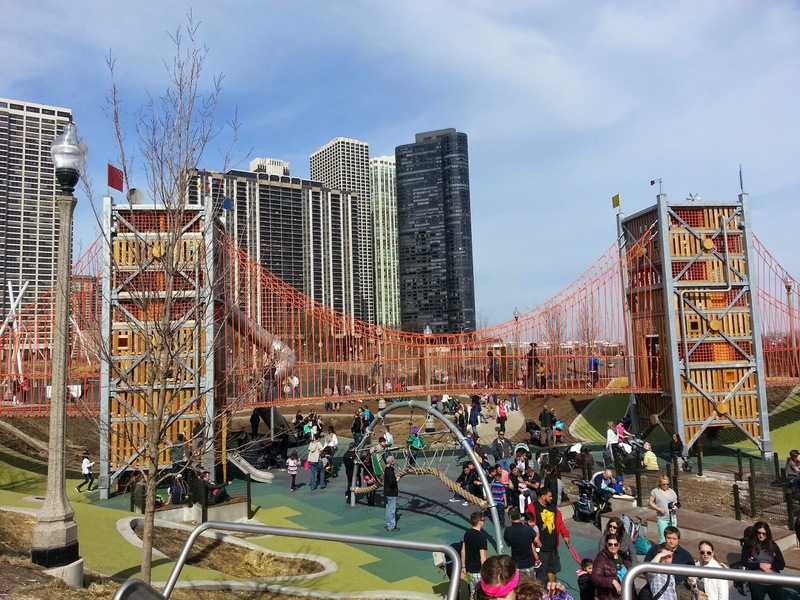 Bridges, massive slides and sky lines last Sunday at the new Maggie Daley Park in The Loop, 337 East Randolph, Chicago IL 60601. The 60 degree weather brought out the locals and tourists in mass. Sometimes you bite the bullet and do something downtown on a Sunday when everyone else will be doing it. 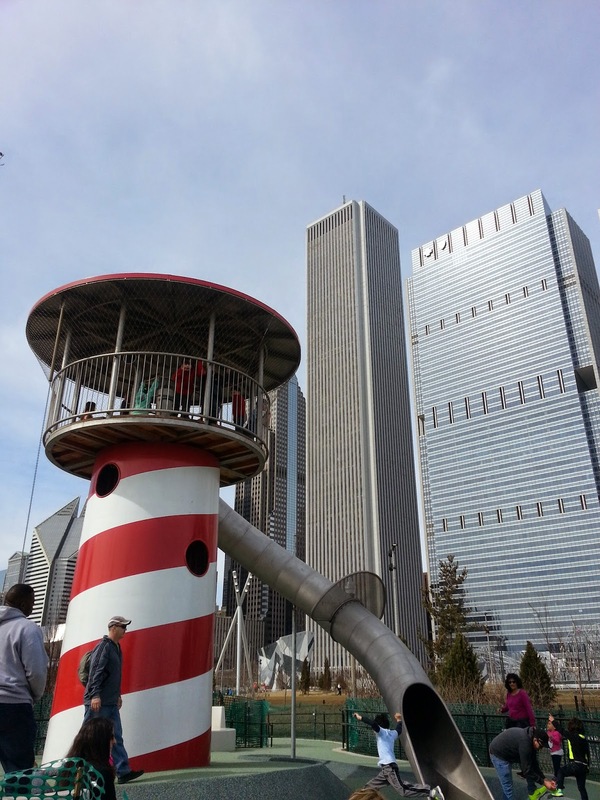 Despite the crowds on a very nice "pre-spring" day there was still plenty of room to play at the insane Maggie Daley Park. Here's an early write-up from Red Tricycle. My wife and I brought six kids ranging 2 1/2yrs through 10yrs old. Lots of walking on cool winding paths will tire them (and you) out. The slides were the unanimous hit. Lots of slides big and small. Not all play area or exhibits are open yet. It will be nice to visit when the site is more complete and filled in with landscaping. Right now it has a little bit of an Apocalyptic Disney/ Lord of the Flies thing going on. Remember no dogs, cartoon, wild or otherwise. 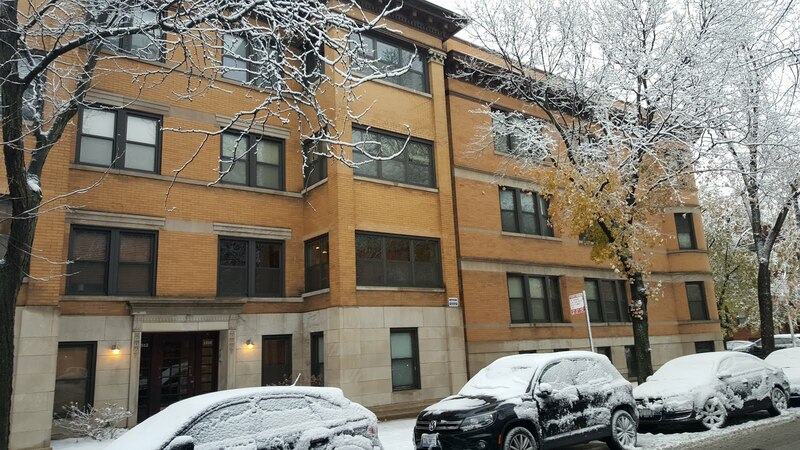 I met a long time associate and client this morning in Lincoln Park to evaluate a condo sale. It's time to part with a one bedroom unit with garage parking on Halsted Street now that she's a single family home owner. 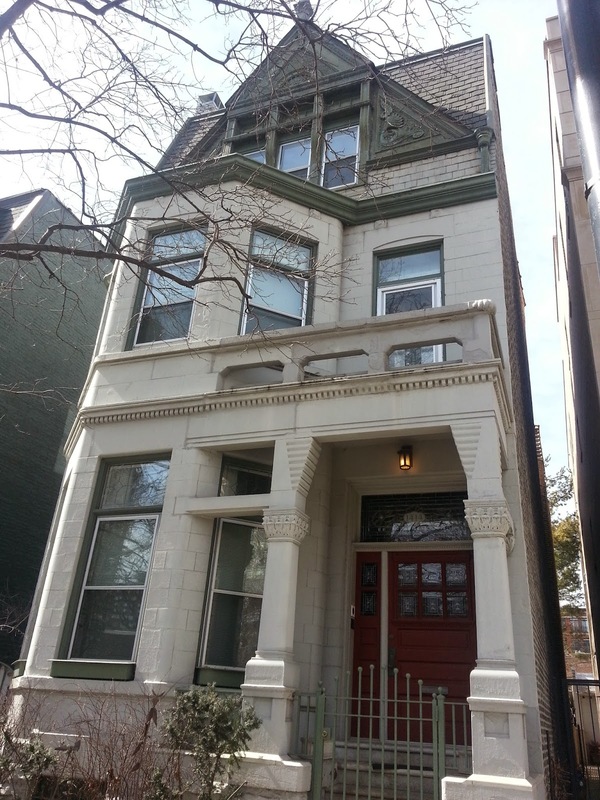 Let's take a look at Lincoln Park one bedroom condo sales in smaller buildings. One bedroom, one bath, garage parking in buildings under 60 units. No one bedroom condo units (including garage parking) in buildings less than 60 units have closed thus far in 2015. This backs us into the fact that there are relatively few of these units available. 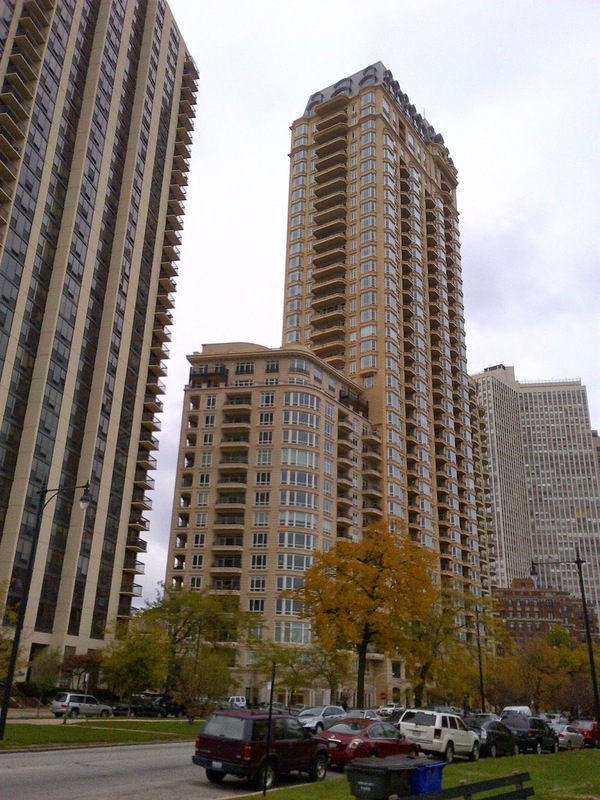 Most one bedroom units with garage parking are typically in large high-rise buildings near the lake. The true "high-rise" lifestyle (with valet parking and big assessments) is not for everyone. One unit (one bedroom, one bath, garage parking, under 60 units) is under contract with an asking price of $299,000. 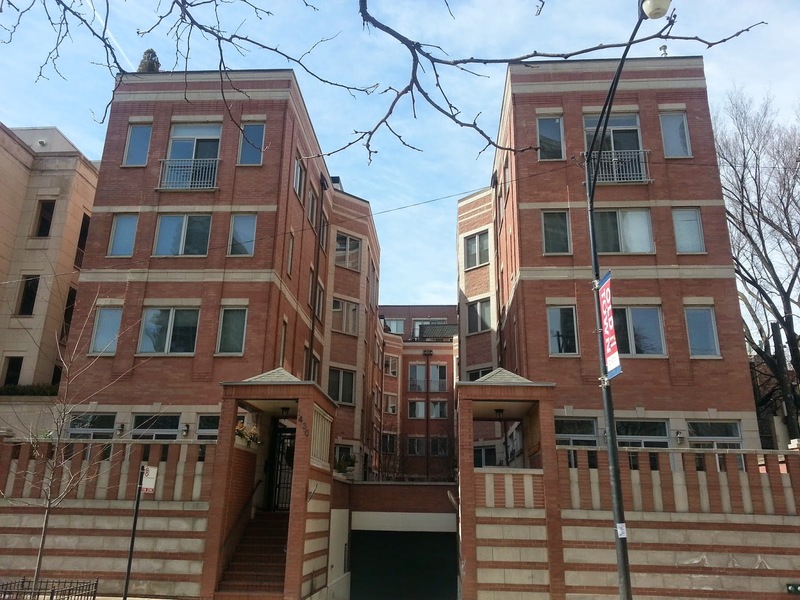 Five more units are actively for sale with a median asking price of $280,000. 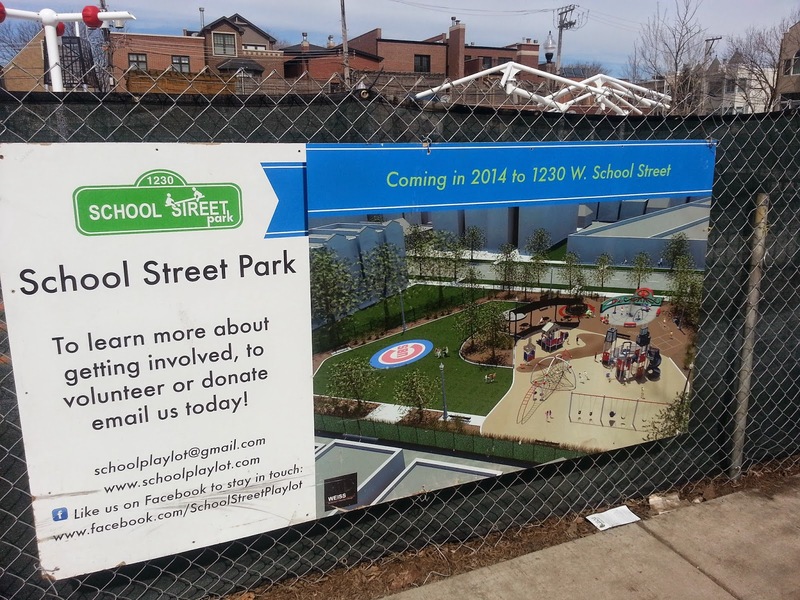 The North Halsted street scape along several blocks of northern Lincoln Park has really filled in. There are few small frame or original brick buildings remaining. In 2014, only 11 units closed with the criteria of one bedroom, one bathroom, garage parking and under 60 units. The median price was a very reasonable $250,000. These buildings are desirable as they tend to be embedded "in the neighborhoods" and carry a lower assessment per unit (about $250.00/ month on average). Remove the 60 unit restriction and 110 units are recorded as closed for 2014. Of course many of these high-rise units have rental parking "included" at an extra fee. Keep a watchful eye on the Lincoln Park market if you'd like a nice, low assessment one bedroom unit with garage parking truly included. Not many will be available in 2015.